The global travel activities market – the amount travelers spend in destination while traveling – includes tours, attractions, events, activities (excluding dining and shopping) and transportation. 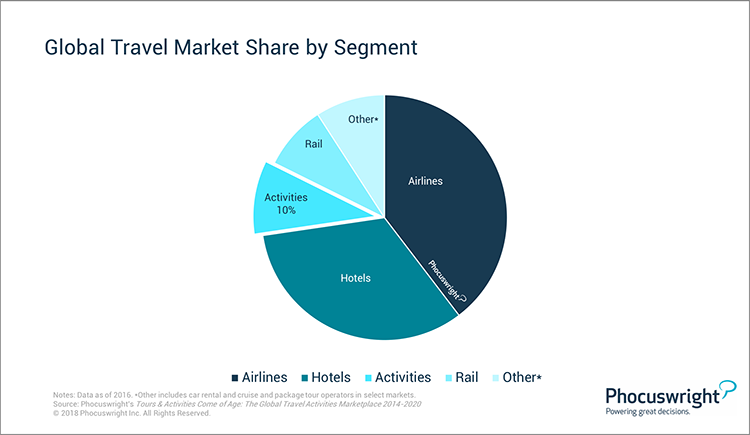 This segment represented 10% of the global travel market in 2016, a larger share than either the rail, car rental and cruise segments (see figure below). Tours, activities and attractions represent 70% of the global travel activities segment, with the remainder including sporting events, performing arts and ground transportation. Both the global travel activities market, and the tours and activities sub-category are growing faster than the overall travel industry. Steady advances over the next several years will take the worldwide travel activities market to US$183 billion by 2020. To read the full (free) report, download it here. This paper, drawing on key travel research and insights from Phocuswright's Tours & Activities Come of Age: Global Travel Activities Marketplace 2014-2020 and supported by Arival, explores the state of the tours and activities segment. We shed light on the massive in-destination activities opportunity; reveal key challenges the segment faces; outline how technology is fundamentally reshaping the tours and activities distribution landscape; and explain why, though online bookings clearly represent the future for tours and activities, not all online booking platforms are created equal. Attend The Phocuswright Conference, held November 13-15 in Los Angeles this year, to hear from travel activities leaders who are transforming the segment that's been attracting a slew of hot investments and acquisitions and what it means for the travel ecosystem. Learn more about the session here. Register early for the best ticket pricing.